alaTest ha raccolto ed analizzato 64 recensioni su LG A380. La media della valutazione per questo prodotto è 3.9/5, confrontata con la media della valutazione di 4.3/5 per altri Cellulari. Le persone rispondono positivamente alla schermo e prezzo. In aggiunta, design e qualità suono ottengono un buon feedback. Abbiamo analizzato differenti valutazioni di esperti ed utenti, età del prodotto ed altri elementi. A confronto con altri Cellulari, LG A380 ha ottenuto un alaScore™ complessivo di 83/100 = qualità Molto buono. Got this phone for my uncle, but it didn't work for him. The problem with the phone is the ascending volume on the phone. By the time he heard the phone ring it would go voice mail. This is good, basic phone which is very hard to find these days. I need something simple for my grandmother and this phone fit the bill. She loves it! I am delighted with this phone. It is attractive and easy to use. Even though it is considered to be a basic phone, it has additional features such as the capacity to take photos. Think i accidently reviewed this phone, my husband's, in place of my G3 on previous Review earlier today. This is his phone, he wanted another flip phone, to clip on belt, and is still learning this one, but has alot of features he's enjoying. THIS PHONE IS AFORDABLE, AND GETS THE JOB DONE FOR SOMEONE WHO DOESN'T NEED ALL OF THE FANCY SMART PNONE STUFF. Great for someone who needs a simple phone. Nice, simple, easy to use. Great product to use. I would recommend it to anyone that needs a phone for everyday use. 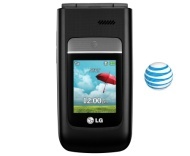 I've always loved flip phones and LG has always made a great product.